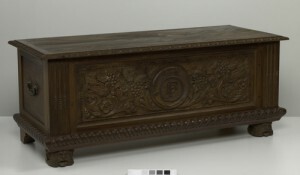 Dower chest carved 1928 for Dulcie Field . Who was Nellie Payne? Dower chest for Dulcie Field. Close up carving front Dulcie Field dower chest. Close up inside lid description. 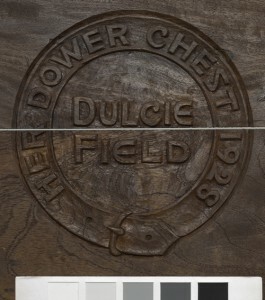 Dulcie Field dower chest. Photo from Nellie’s scrapbook of Dulcie Field dower chest. 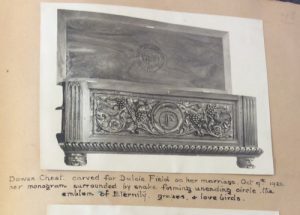 Photo from Nellie’s scrapbook of Dulcie Field dower chest lid open. 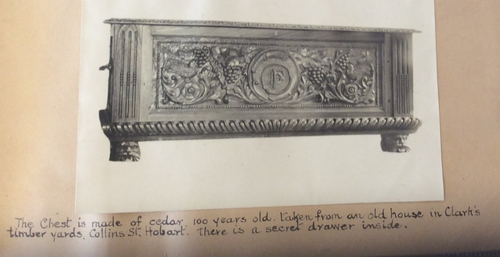 This beautiful dower chest has been donated to the Tasmanian Museum and Art Gallery, Hobart. Photographs attributed to them except those from Nellie’s scrapbook. “Ellen Nora Payne – Woodcarver of Tasmania” by Russell Atkinson. “Nellie was accustomed to seeking out special pieces of timber wherever she could find them. She was a familiar figure in timber yards, auction rooms and the shops of second-hand dealers, the proprietors of which, being under her spell, would often notify her of bits of timber which they thought might be suitable for her purpose. She had, in fact, all sorts of people on the lookout for pieces of carvable wood, and many were the handsome pieces she picked up and carried home in triumph to her work-bench. She was in luck one day in 1928 when she was looking for a special piece of timber for a dower chest for her great-niece, Dulcie Field, who was about to be married. In Clark’s timber yard in Collins Street, Hobart, she came across some fine cedar planks which had come from an old house that had recently been demolished. Those planks were a hundred years old, beautifully grained and without a flaw.